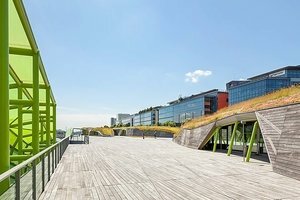 This incredible rooftop space is in the 13th arrondissement of Paris in the area of Quai d’Austerlitz. It is an ideal location for brands to host a Fashion Show, Late Night Event (after 10pm), Corporate Event or Photoshoot & Filming. 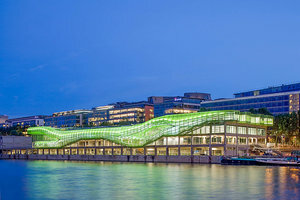 Situated directly next to the Seine on top of a modern building with a unique design, this space is unlike any other. With a wooden flooring and grass areas sprouting above entrances to the main building, this space is distinctive with a peaceful atmosphere. 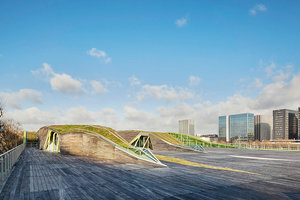 The large green metal structures surrounding the rooftops periphery, give this space a contemporary edge. 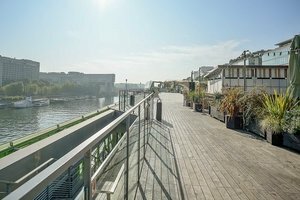 This loft space situated along the Seine on the Quai d’Austerlitz is a blank canvas ideal for hosting memorable events.